Modifying alimony in Tennessee divorce and family law to increase, decrease, or end alimony. Modifying alimony first requires proving a material change of circumstances to raise, reduce, lower, or terminate alimony. The volume of Tennessee alimony modification cases appears to have increased over the last few years. This may be due to the 2008 economic downturn or the natural aging of America. The ferocity between the parties in these cases also appears to be as high as ever. Many people paying alimony disdain having to support their ex-spouse years after the marriage has ended, yet many alimony recipients rely on those payments to live. Entitlement depends on the person’s perspective. As a result, disputes will continue to occur. Seeking to modify alimony is never as simple as it seems. 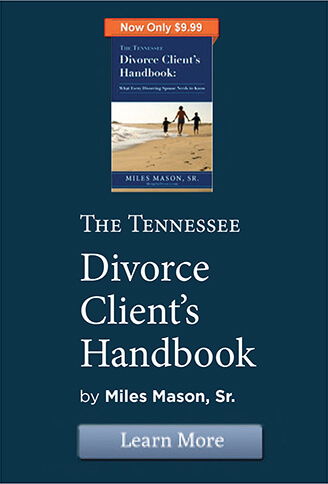 The information and opinions on this page are only offered as an introduction to basic Tennessee law on alimony modification and is not intended to be a complete discussion of the issue. Every case is different. Furthermore, exceptions can apply that are not discussed herein. As you have read before on this site, see a competent family lawyer to discuss your case. Alimony Modification in Tennessee by Memphis Divorce Lawyer Miles Mason, Sr. Step One: What Type of Alimony Is at Issue? Whether or not alimony in Tennessee may be modified or terminated depends on the type of alimony that has been awarded. In addition, how the alimony was specifically worded can matter a great deal. The four types of alimony are (1) alimony in futuro (also called periodic alimony), (2) alimony in solido, (3) rehabilitative alimony, and (4) transitional alimony. In general, only alimony in futuro and rehabilitative alimony can be modified. Does it matter whether a court awarded alimony or whether there was a settlement where the parties negotiated the specific terms of the provision? Yes and no. Determining the type of the award is still the first step. Alimony in solido and transitional alimony are not modifiable, regardless of whether the court granted the alimony award or it was negotiated in a settlement. But if the alimony is either rehabilitative or in futuro and the parties agreed to the language, it is possible that the court may view the alimony differently. For example, suppose the divorcing parties agreed in a settlement to language stating that the alimony recipient was expected to return to work after a reasonable period of retraining. A court might look more critically upon a spouse who agreed to that language and failed to pursue retraining than it would if the court itself had ruled the same thing. As always in family law matters, the complete set of circumstances is what matters. Life happens. Unanticipated problems occur. Car wrecks, plant closings, and cancer are all examples of unanticipated events courts will factor into the equation. If the divorce decree does not state what type of alimony was awarded, the court will still need to determine what type of alimony it is in order to determine what Tennessee alimony law requires before its modification. The court will have to look for clues to match up the award to the right type. Believe it or not, this happens more often than one might think. The purpose of the award matters. Alimony in solido is generally used to make a buyout of property division over time. Tennessee law states that rehabilitative alimony is preferred over alimony in futuro. To award rehabilitative alimony means the supported ex-spouse can be rehabilitated. What does rehabilitated mean? To one judge, it might mean that the supported person can be self-sustaining. To another judge, it might mean the person can return to the lifestyle he or she enjoyed during the marriage. Transitional alimony is sort of like rehabilitative alimony except that it cannot be modified. Finally, alimony in futuro (or periodic alimony) is awarded when the court determines that a supported spouse cannot be rehabilitated or the parties agree to it. In either case, the alimony in futuro award can be modified if there is a change of circumstances. Definitely see a lawyer about answers to questions about your specific type of alimony. Plus, alimony modification law evolves over time and could be substantially different in between the time this was written and you read it. Tennessee alimony modification law provides that “modifications of alimony may be granted only upon a showing of a substantial and material change in circumstances since entry of the original support order.”  “In order to be material, a change in circumstances must have been unforeseeable, unanticipated, or not within the contemplation of the parties at the time of the decree.”  “To be considered substantial, the change must significantly affect either the obligor’s ability to pay or the obligee’s need for support.”  In appellate opinions, Tennessee law has dealt with, and will continue to deal with, specific situations in which courts have found changes of circumstances. This means each case must be individually researched. For example, under settled Tennessee alimony modification law, whether the supported spouse was unemployed at the time of the divorce but is employed now is not legally relevant to the court’s determination unless the original ruling was predicated upon a “presumption that the [former] wife would not continue to increase income through pursuit of her career.”  Many rulings may not have that kind of detail. But some do. For settled divorces, parties are often reluctant to agree to any language concerning the future because no one knows what the future will hold. Many feel it is better to be silent and not give the other party a built-in reason to modify the alimony award later. Remember, while one party may seek to reduce the obligation, the other may seek to increase it. Regardless, many family law commentators encourage family lawyers to address specific factual circumstances in settlement documents, and they likewise encourage judges to be more specific in drafting rulings. If the decree states what the award is predicated upon and if something changes, that should serve as a legitimate basis for a modification unless the change was foreseen. What about retirement? Retirement is foreseeable, isn’t it? Or is it? In 2001, the Supreme Court of Tennessee set the standard for applications for alimony modification due to retirement: “So long as the retirement is objectively reasonable and taken in good faith, we will not look to the potential income of the retired obligor, and we will give the reduced ability of the retired obligor to pay support at least equal consideration with the need of the receiving spouse.”  This “objectively reasonable” standard can be very challenging for lawyers answering questions to persons seeking or defending against an alimony modification. On one hand, alimony payors believe everyone should be able to retire eventually. On the other hand, the need of the receiving ex-spouse rarely decreases. No hard and fast rules apply here. Judges deciding alimony modification cases due to retirement have a great deal of discretion. Step Three: How Much Will the Tennessee Alimony Modification Be? Even though courts may be required to hear proof on the statutory factors, the most persuasive arguments will concern what has changed. In application, some judges may not want to rehash fault facts from the marriage, even if that was an important part of the original award. Many lawyers will say Tennessee alimony modification is simple, while others will say it’s not. Like many other controversial aspects of family law, the rules aren’t necessarily all that complicated. It’s the application of the particular situation to the rules that makes it so challenging. What is or is not “foreseeable” or “anticipated” is another catch-22 problem lawyers and judges must face. People get older as time passes. Many get sicker as they get older. Does that mean that some illness is anticipated? As with many questions posed in family law, the answer may depend on the perspective of the person answering the question and its impact on that person’s financial future. As you may have surmised from this page, this complexity arguably helps make transitional alimony the most popular form of alimony today. In a settlement, choosing a non-modifiable form of alimony can help both parties to avoid future litigation. That is always a great selling point in any divorce. 1 T.C.A. § 36-5-101(a)(1) (Supp. 2001); Bogan v. Bogan, 60 S.W.3d 721, 727-28 (Tenn. 2001). 2 Bogan, 60 S.W.3d at 728; Elliot v. Elliot, 825 S.W.2d 87, 90 (Tenn. Ct. App. 1991). 3 Bogan, 60 S.W.3d at 728; Bowman v. Bowman, 836 S.W.2d 563, 568 (Tenn. Ct. App. 1991). 4 McCarty v. McCarty, 863 S.W.2d 716, 720 (Tenn. Ct. App. 1992). 5 Bogan v. Bogan, 60 S.W.3d 721, 733-34 (Tenn. 2001). 7 Code Ann. § 36-5-121(i)(2005).